Launched almost 5 years back Runwal Greens faced tough competition from HDIL, Nirmal Lifestyle and Marathon in the early stages of construction. Runwal which was not known at that time for using the best of the technology surprised one and all by using Mivan technology for construction of this project. It was a runaway success keeping in mind the scale and magnitude of development. However, the original plan which was communicated by Runwal in 2010 and the one presently in place is different. The project is already delayed by 2 years and the current possession date has moved from Dec,13 to Dec,15 – Apr 16. Runwal Greens has a very interesting layout. With an almost rectangular plot shape, the building placement has been done in a very efficient manner. This means that common area will house all the amenities and give a feel of grandness as so much of open space is really a luxury in Mumbai Real Estate market. As per the layout, there are 8 buildings in the complex but the placement ensures that there is sufficient space between the buildings while the common area is concentrated in the centre of the plot. 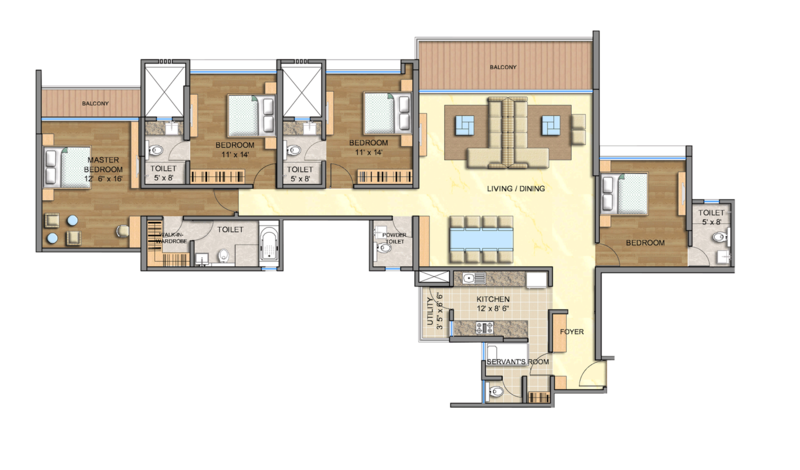 The small 2 BHK comes in 2 specific variants: 689 sq ft and 732 sq ft (carpet), which is a little too small for my liking. In an effort to reduce the ticket size developers today have been cutting on the most important thing in the apartment which is space (a big crime!!!). When you ask me to pay more than 1.5 crores please don’t give me a kitchen which is 42 sqft (6 ft *7 ft in this case) and a bedroom which is 110 sq.ft. (11 ft * 10 ft.). It’s a basic layout which would interest pure investors and not end users. If you are an end user the 2.5 BHK is something we would suggest. The living is nice and spacious and it comes with a separate dining area; a 40 sq.ft. deck attached – a luxury of some sort. The master bed with attached deck, spacious toilets, and kitchen with a separate utility to store goods are pretty spacious. Nicely laid out apartment. It gets a thumbs up from our side. Ideal setting for a young family. 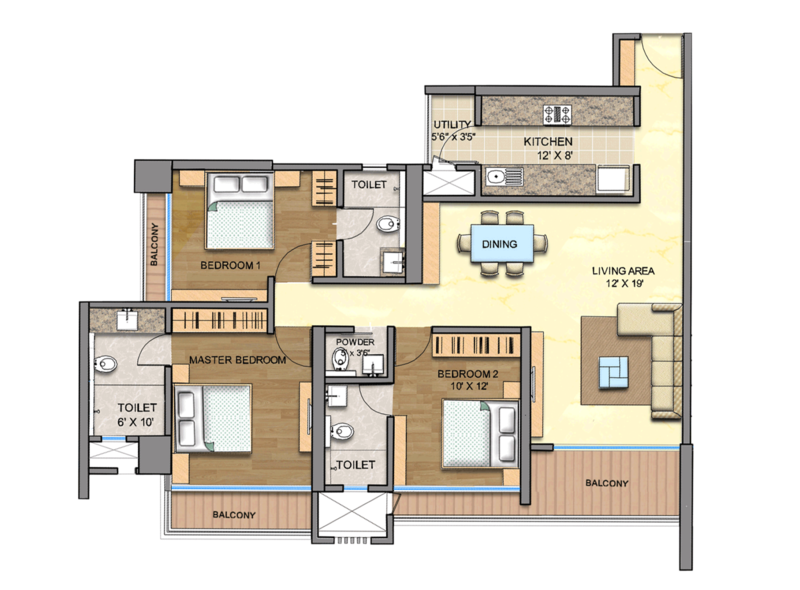 The 3 BHK is nice – not extravagant but it is nice and roomy for the aspirational category. The fact that all apartments have a clear height of 11 ft (claimed by the developer) give the apartment an expensive look and feel. The living room is voluminous (more than 200 sqft) with a separate deck and dining area. Wow! In lines with the 2.5, BHK’s the 3 BHKs also come with spacious bedrooms (14*11), (12*10) & (13*10) and a nice kitchen with a separate utility which acts as a storage zone for you. Would we buy them – YES – Big Yes!! 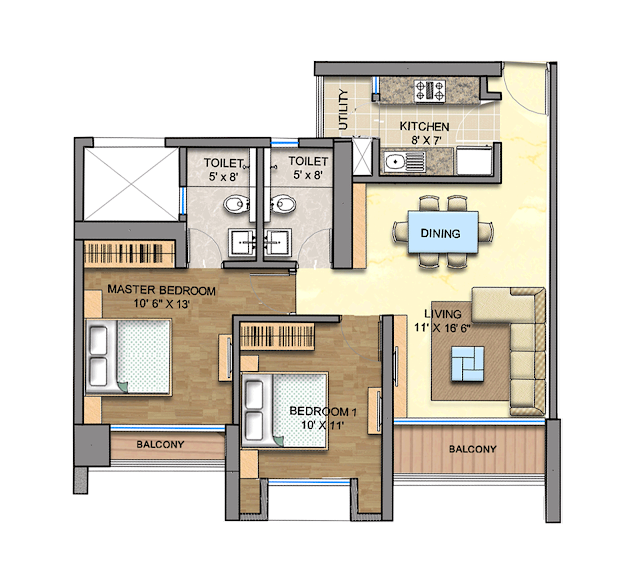 The 3 BHK Grand is definitely meant for you if you believe you want that extra space in life – There is a difference of almost 120 sqft which is reflected in the living and kitchen areas. It would be money well spent if you can afford this for sure!!! Both of them are large opulent and expansive in design. Well laid out. Especially the one in Cypress has a huge living area of more than 250 sq ft and it comes with a deck attached more than 100 sq ft which will surely ensure your friends and family envy your lifestyle. Large bedrooms with huge toilets ensure these homes look like palaces in the sky. A must buy if you can afford it, they don’t make such apartments anymore!! Contrary to popular perception Nahur is actually a reasonable location in terms of social infrastructure. Its seamless integration with Mulund and Bhandup give it a thumbs up. 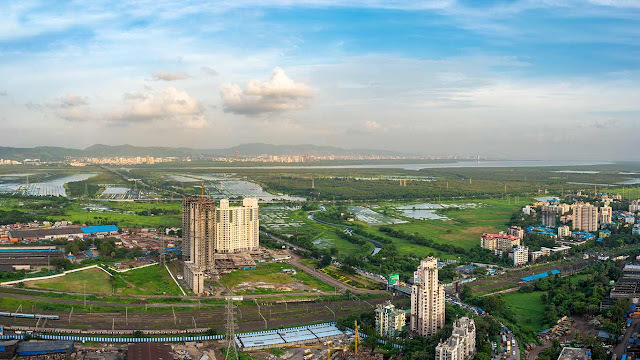 Runwal Greens, located a stone throw away from Nahur station and 10 minutes from Mulund station, has an advantage which hardly few projects in the central suburbs would have (Aurum Grande being an exception) in terms of connectivity. Located on the Goregaon-Mulund link road, you can get a quick get away to the eastern express highway connecting you to the city. With D Mart and Nirmal Lifestyle within a 2.5 km range, it all seems pretty good. Having said that Nirmal Lifestyle which is almost 15 years old is losing its charm so you might rather want to venture out to a new shopping destination. 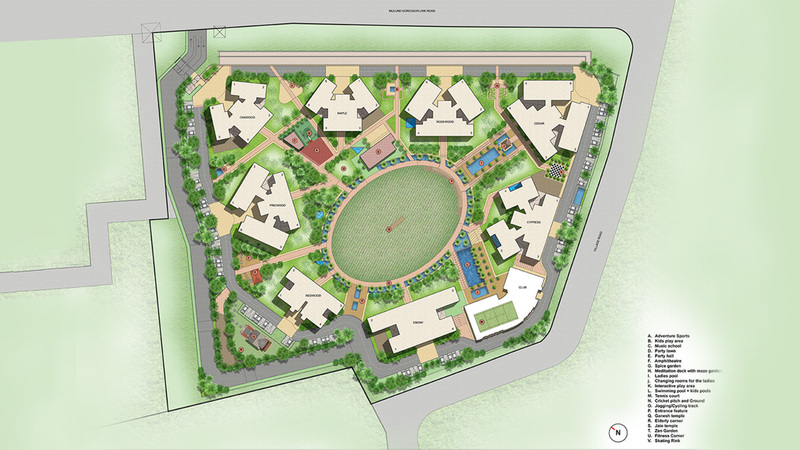 Overall the project is a winner, with 7 acres of open space for greenery, a world-class clubhouse, lifestyle amenities, clear views of hills & creek and location advantages, it offers a complete bouquet of luxury lifestyle. I think apartments here are under priced. The apartments are fully loaded in terms of amenities, marble flooring, AC’s, high-end sanitary ware.